Welcome to the plasticizers comparison tool where you can explore an array of plasticizers to meet your needs. The following steps will guide you to the information needed. An overview of the tool is displayed below. If you need help, visit the help button. 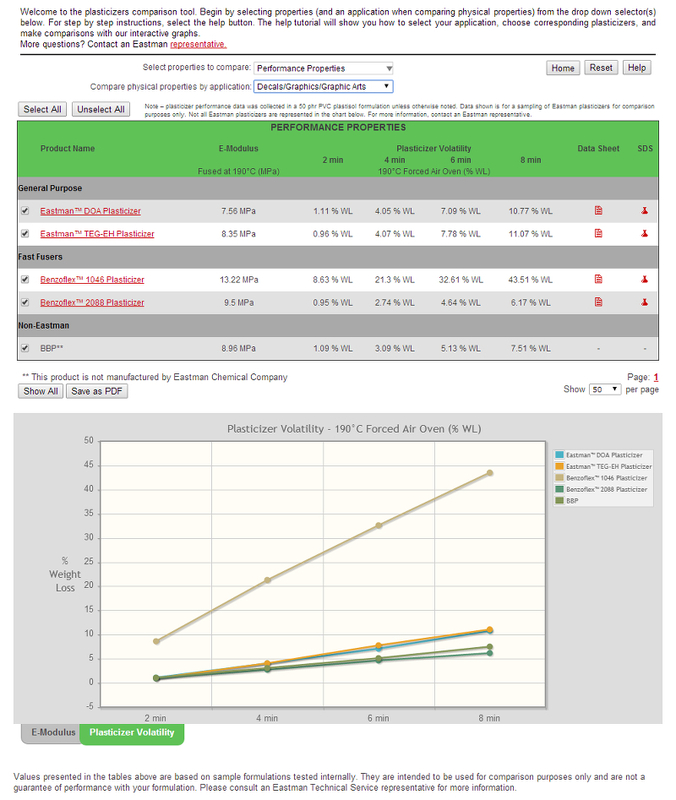 Welcome to the plasticizers comparison tool. Begin by selecting properties (and an application when comparing physical properties) from the drop down selector(s) below. For step by step instructions, select the help button. The help tutorial will show you how to select your application, choose corresponding plasticizers, and make comparisons with our interactive graphs. Questions? Contact an Eastman representative. Note – plasticizer performance data was collected in a 50 phr PVC plastisol formulation unless otherwise noted. 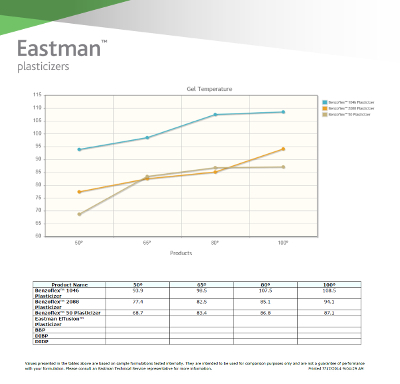 Data shown is for a sampling of Eastman plasticizers for comparison purposes only. Not all Eastman plasticizers are represented in the chart below. For more information, contact an Eastman representative. Note: Charts will only display when comparing Performance Properties. Values presented in the tables above are based on sample formulations tested internally. They are intended to be used for comparison purposes only and are not a guarantee of performance with your formulation. Please consult an Eastman Technical Service representative for more information.